Enjoy an interesting tour of the Center of the World, feel the sensation of being in two hemispheres at once. In the Middle of the World City will find a variety of museums, craft centers and art events that will give to know the cultural essence of Ecuador. In the morning our tour guide will pick you up at the hotel due to the viewpoint of the volcano crater Pululahua the only inhabited in the world. This volcanic complex consists of a main boiler, a central volcano with two craters and the remains of a third party, and several volcanic domes within the caldera located on the edge of it and outside. 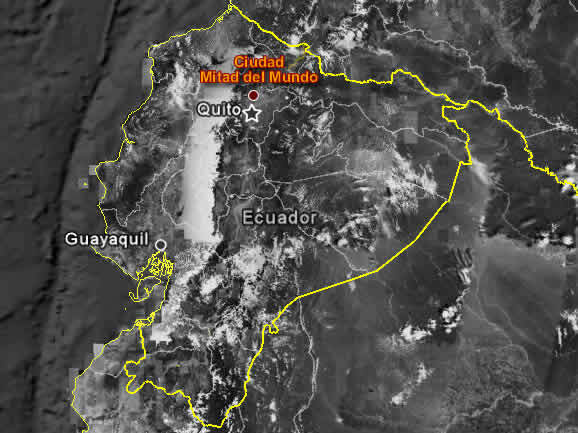 We left at north of Quito, towards the town of San Antonio de Pichincha, location of the Equator, and the Tourist Complex "Ciudad Mitad del Mundo." Its architecture is based on a typical sample of the colonial style and inside is the Equatorial Monument, perched on Latitude 0 º 0'0 ", where you may be in the two hemispheres at the same time. We begin our tour of the Eastern Hemisphere in Geodetic Avenue, where there was 13 busts, belonging to the scholars and members of the French Geodesic Mission First, who came to Ecuador in 1736 to measure a meridian arc of land and monitoring how of the Earth. We continue our tour of the Northern Hemisphere, where we will see the City Center of the World, which offers national and international tourists, various services such as restaurants, handicraft shops, art galleries, phone, mail, etc..
Then we head to the monument to the Middle of the World 30 meters high, built in 1979. Inside observe the Ethnographic Museum which consists of nine levels, which are distributed the various ethnic and cultural groups in Ecuador. To end our tour will visit the Planetarium, where you can observe any point on the earth, and imaginary journeys through the universe. Also in a real visualize the different celestial bodies can be seen in the sky.